Branford, CT: My Gene Counsel, a digital health company that provides personalized, easy-to-understand, continuously updated reports for people who have had genetic testing, today announced that the company has extended its content reporting to include additional hereditary cancer genes. The expansion comes just one month after the initial launch of the BRCA product and is another step in My Gene Counsel’s goal to service the entire range of genetic test results. “If you have had genetic testing using a hereditary cancer gene panel, we now have a report customized for your results,” said Ellen Matloff, President and CEO of My Gene Counsel. Previous My Gene Counsel reports only covered BRCA1 and BRCA2 content. 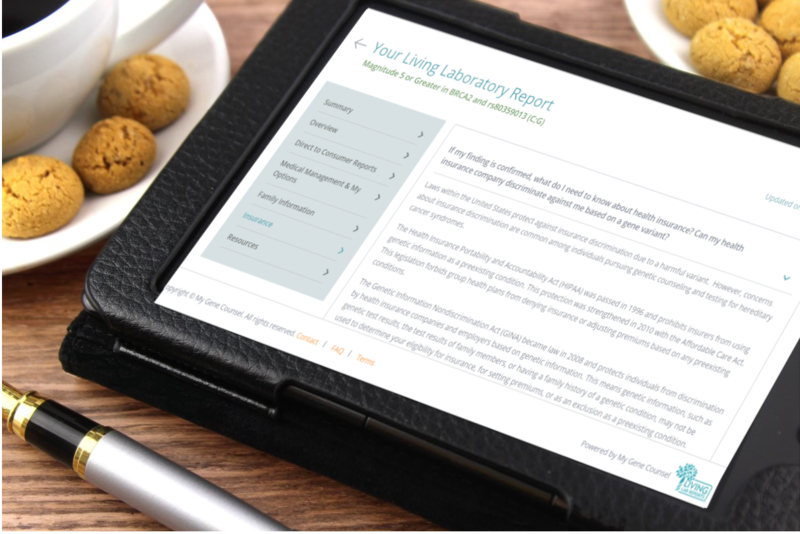 Now, the company offers personalized Living Lab Reports® for all hereditary cancer genes included on standard panels from the major laboratories, as well as genes included on the American College of Medical Genetics and Genomics list of returnable findings. If someone tests positive in this category of genes, the result is considered actionable, meaning steps can usually be taken to prevent or reduce the risk of cancer or detect it earlier. Unlike other information resources, My Gene Counsel’s Living Lab Reports are continually updated regularly with the latest information, including reclassification of gene variants, updated clinical information, clinical trial opportunities, and legislative changes. As new data unfolds, patients are alerted via email and/or text. My Gene Counsel plans to expand its reporting to include cardiac, pharmacogenetic and many gene panels offered in the direct-to-consumer marketplace. By 2019, My Gene Counsel will be the most complete, publicly available resource for hereditary diseases by offering a scalable solution to accommodate the growing need for personalized genetic information. About My Gene Counsel: My Gene Counsel is a HIPAA-compliant digital resource for genetic information and a one-stop-shop to stay on top of advancements tied to personal genetic test results. The company was founded in 2014 by certified genetic counselors with more than 30 years of clinical experience and leadership in genetic counseling and testing. From deep in the trenches of clinical care, they saw the need to provide consumers and clinicians with a progressive, digital method of staying up-to-date on their genetic test results. For more information, visit www.mygenecounsel.com.